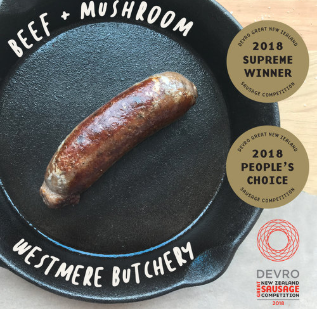 After having the pleasure of being a judge at the Devro Great New Zealand Sausage Competition it was great to see the result announced. In a first, joint winners were awarded the Supreme Award. 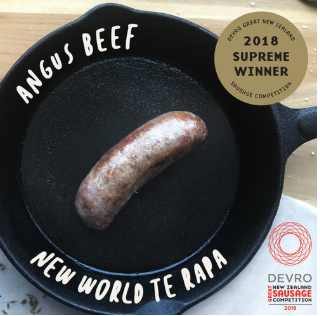 Te Rapa New World’s Angus Beef and Westmere Butchery’s Beef and Mushroom shared the top award. To come through a field of nearly five hundred sausages in thirteen categories is real achievement. I judged the beef section and I can attest to the quality of the Angus Beef sausage. All judging is completed blind, and when we get to that special sausage that stands out, it is a real pleasure. Congratulations to all the winners. I know from experience that the awards are a closely fought competition with many great sausages being sampled over my two days of judging. From a Wellington perspective it is good see a Cameron Harrison black pudding and Eastbourne Village Meats Red Roma receiving medals. I am looking forward to sampling these sausages. Below is a list of this year’s winners.